The Vestry Café – (to reflect it’s former use as a church,) is based in the Heart of the town Centre, and is also Hartlepool Borough Council’s Art Gallery and Tourist Information Centre. This is a Fair Trade café ran by students from across the Trust and provides teas and a selection of coffees plus a delicious range of food, freshly-made on the premises (which boosts a 5 star review on trip advisor!) Students of all abilities (MLD, SLD & PMLD) work in the café as part of their foundation learning choices at KS4 and as part of their study programme in Sixth Form. 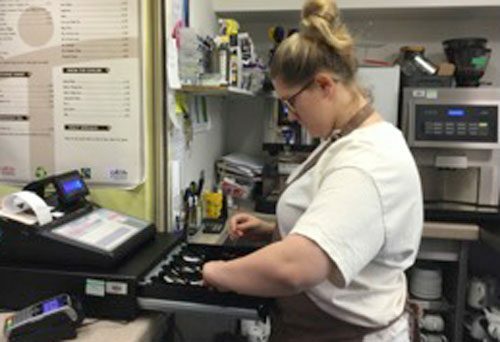 Students gain confidence and skills in the catering and customer services sector, working in the community with members of the public. Highly skilled job coaches who are trained in Task Specific Instruction (TSI) support students to job carve. Some students work weekends and holidays and receive a bursary.